Sam Nagmay places discs on a cloud section. Jim Schmidt taps threads into the perforated panels of the marked clouds. A sculpture by Horatio Law was installed last week in Tacoma’s Lincoln District. Lincoln is Tacoma’s International District and is anchored by dozens of Southeast Asian-American businesses. In Shimmering-Cloud Gateway, two giant stainless steel clouds reach out over the neighborhood’s main street, S 38th. Horatio has posted videos from the install on Instagram. One of Horatio’s great gifts as a public artist is his knack for bringing the community into the creation of the work. He spends a lot of time in a place and frequently brings in the hands and ideas of neighbors and local workers. However, the actual construction of a durable, outdoor public sculpture is still taken care by an professional fabrication studio. For Shimmering, Horatio hired Art + Design Works of North Plains, Oregon. This was my way into the project. Schmidt’s place in the woods. The fabrication workshop for Art + Design Works is on the left. Jim Schmidt’s stainless steel sculpture of a giant ice cube tray raft with patina’d paddles is on the right. I had been called out to A+D Works earlier in the autumn to help with the paint finish on some very large swans bound for North Carolina. While I was dealing with the swans, Jim Schmidt and Sam Nagmay were welding perforated stainless steel panels between stainless steel ribbons until they matched both Horatio’s designs and the engineer’s specifications. After the swans were complete, I brought my youngest daughter out to visit the shop. Jim showed us the next challenge: how to attach between 13,000 and 18,000 1.5” metal discs to the clouds so they could shimmer in the wind and rain and yet never fall off. This wasn’t a paint challenge (and Jim had already worked out the process details), but my fingers tingled. I wanted to join the party. Jim called me a week later to see if I still wanted in. 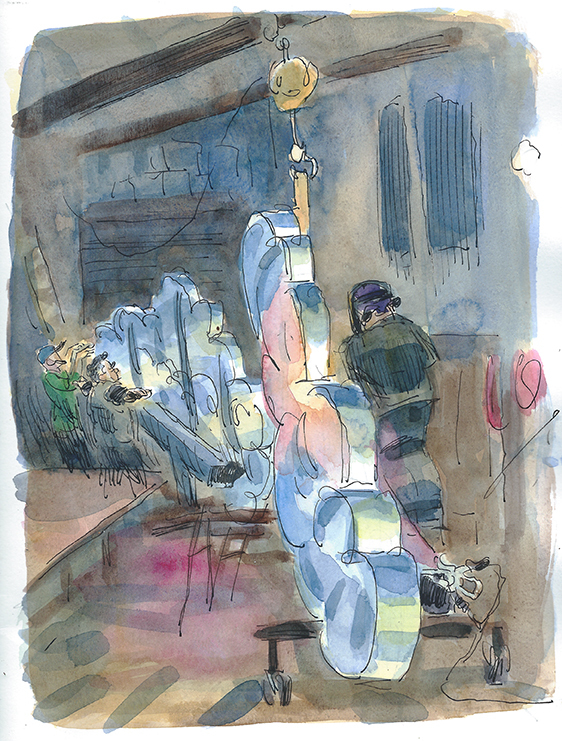 Much of the disc/sequin prep started at Sam Nagmay’s sculpture studio in Portland. Each disc had a little hole punched through it. All the discs were fitted with screws and locking nuts. The nuts had to sit precisely on the screws, too far out and they won’t thread securely into the panel; too far in and you lose the dangle action. Brady Sheets machined several jigs with hex tips as a base for tightening the nuts. 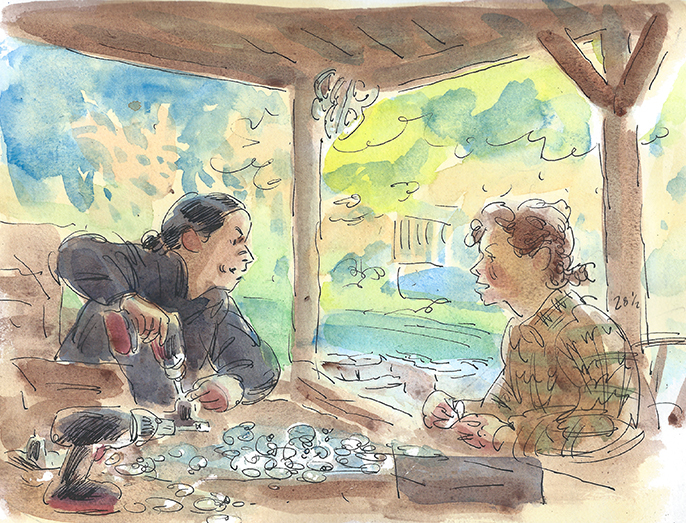 Sam Nagmay and Sarah in the covered patio of Sam’s NE Portland studio. Sarah runs the screw through the disc and twists on the nut. Sam tightens the nut on the jig. After nearly a week of disc assembly at Sam’s and an all-day screwing bee held by Brady’s family out in Banks, Oregon, we had six five gallon buckets filled with prepped sequins. 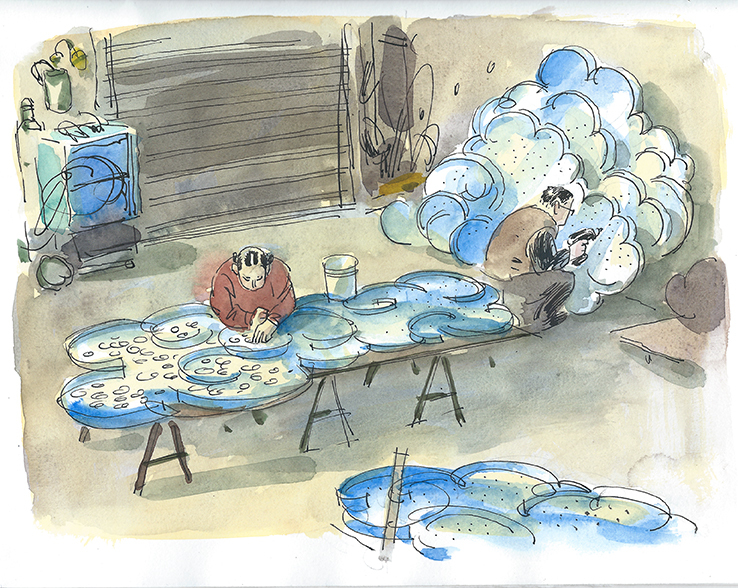 Back in the A + D HQ, Sam and Horatio met up, spread un-prepped discs across one of the clouds and determined how much space each sequin required to achieve maximum coverage and un-interrupted hang. Disc counts for each cloud were estimated and tossed into labeled buckets. Sam again dumped the flat, un-prepped discs onto a cloud. She pushed and teased them into location. I followed behind her, spinning each disc so they were all in exact alignment with the expected plum-line of the installed clouds. In her turn, Sam came around and marked the perforation hole beneath each disc with a white stainless steel-safe marker. Each disc went into a smaller bucket to be placed into the matching section on another cloud. We flipped up the cloud and Jim tapped threads into the white hole with a small drill. Shimmering has two beams of clouds. Each beam as three clouds per side, slightly overlapping. After each cloud was marked and tapped, the stain from the welds had to be cleaned and surfaces degreased. This was done first with a TiG Brush and then a very mild acid and a neutralizer (Dawn dish-soap). If anyone ever asks if you want to try a TiG Brush, say, “Yes, please!” I’ve got no pics of the TiG Brush in use, but imagine this: a carbon-fiber paint brush tip on a sturdy wand calling up sparks and blasting stains into smoking soot. We wiped down the clouds and took them out for a final rinse. Jim gets the soap off. Brady and Sam took turns welding the clouds to the beams. Usually, this seemed to mean a lighter placement tack, followed by a thicker weld. Getting in between the clouds was tricky. Sam and Brady had to improvise a small, flexible hood for the tightest spots. As welding continued, Jim and Briar, a rigger (and Brady’s brother), discussed how they would swing the clouds off the truck and into place in Tacoma. Public Art fabrication is a massive ongoing conversation about logistics. Every material and structural consideration has to be predicted, tested, revised, applied and then guided through overlapping layers of public and/or private bureaucracy. From the first template cut to the last sidewalk bolt, Sam and Jim toss challenges and solutions off of each other, often reaching the same conclusion from opposite directions. How were the steel clouds swung from wall to saw-horse to wall to gantry? Two or three people lifted them onto a set of dollies, just like you rode around on the gym floor in 4th grade. A view of the shop with one cloud in motion, one on the beam and another hanging from the gantry. Matt, trucker, crane-operator and wind turbine-rigger, operates a tiny screwdriver. As the clouds joined the beams, we called a couple more hands to attach the sequins. Matt, a rigger buddy of the Sheets brothers dropped in for an afternoon, and artist, Ilan Schraer, came out to do a few days on the cloud wall. Every nut was hit with red Loctite and then screwed into a tapped hole on the cloud. At first, most screwing was done by hand, but soon we added very low-power drivers to the mix, finding the sweet spot between speed and an over-torquing mess (stainless steel is finicky). Sometimes we had to re-tap a hole or move a disc one hole over, not too often though. The exact number of discs prepped came within a few hundred of the exact number needed. A handful were tossed aside as stripped or stuck. In the final hour of the sequin dash, I took a hex jig from the tool room and assembled one last pile of sequins. Ilan juiced them with Loctite. Brady, Sam and Jim, busy elsewhere as well, took turns screwing them in. We called the sequins done. Outside the shop, in the last of the twilight, Jim ran the orbital over the support columns. We zapped and scrubbed them down. Sam and Brady began to ready the clouds for loading. Brady adds locktite. Sam pauses as Jim changes out the tabouret on the scaffold. Ilan screws in another sequin. I missed the loading and install excitement. 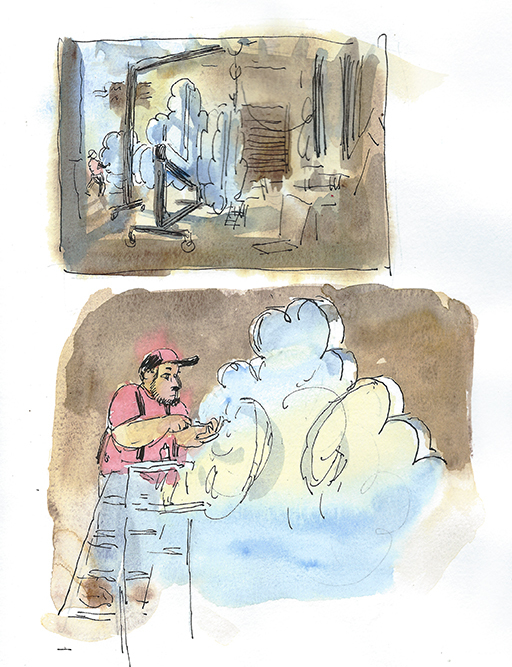 I was back in Portland, inking and coloring my quick pencil notes. Like you, I’m relying on Horatio’s videos to see how his work looks on site. I have a kid at school in Tacoma; I’m sure I can cough up some excuse for the drive, maybe before Christmas. If I’m lucky, shimmery-sequin-action-wise, it’ll be a sunny day and a windy day and a rainy day all rolled into one. Oh! Hey! The ribbon-cutting ceremony for Shimmering-Cloud Gateway happens this Saturday, November 17th. Horatio will lead a tour starting at 10:30. Alright, maybe I’ll wish for not too much wind and rain, just enough to sparkle.